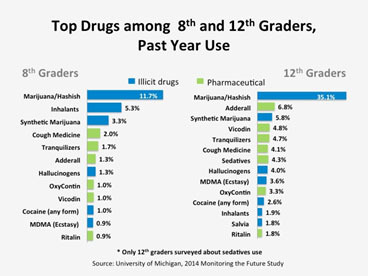 The University of Michigan’s 2014’s Monitoring the Future survey of drug use and attitudes among American 8th, 10th, and 12th graders shows an encouraging trend in youth substance use. Use of alcohol, cigarettes, prescription pain relievers, inhalants, synthetic drugs (including K2/Spice and bath salts) is decreasing; use of marijuana has neither increased nor decreased; and the use of illicit drugs has generally declined over the last two decades. Despite these promising statistics, as long as students have access to mood altering substances, the potential for using and abusing them exists. And often, students who are struggling with symptoms of depressive illnesses will “self-medicate” with substances, in an attempt to relieve their symptoms. In addition, many of the symptoms of mental illness listed here may also point to a developing substance use problem.